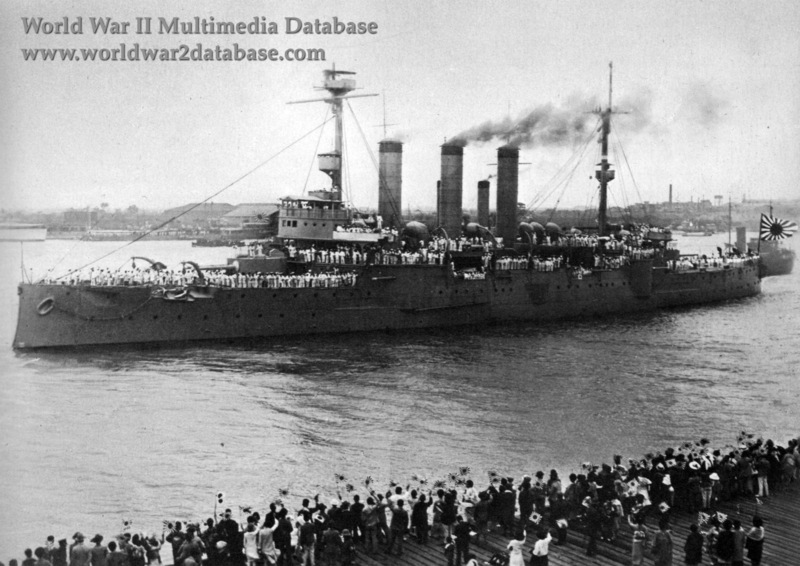 IJN protected cruiser Idzumo steams into Shanghai and receives the welcome of a Japanese flag-waving crowd after the capture of the Chinese section of the city. Sailors in dress uniforms line the rails. Idzumo was commissioned in 1900 and served at the Battle of Tsushima, where Japan defeated Imperial Russia and achieved world notice. In 1923, as part of the Washington Naval Treaty, she was rerated as a training ship, but continued to serve as a vessel of war. She spent the whole of the Sino-Japanese War and the Pacific War in China, serving as flagship of the China Area Fleet, the only major combatants not under the command of the Combined Fleet. On August 14, 1937, in response to Japanese bombing of Shanghai, Kuomintang Northrop 2E bombers attempted to attack Idzumo, but missed. Three bombs struck onlookers at Nanking Road and Edward VII Avenue; 1,740 people were killed and 1,873 injured. On December 7, 1941, Idzumo led gunboats in sinking HMS Peterel and capturing USS Wake two hours after the attack on Pearl Harbor. Idzumo returned to Japanese waters and was sunk on July 28, 1945 at Kure by American carrier aircraft.